A medical device manufacturer selected Mercator Robotec to supply a machine vision solution for a new machine that assembles one of its products. Mercator Robotec analyzed the customer’s unique needs to develop an innovative four-station machine vision system. This flexible system allows up to 4 part styles or assembly configurations to be selected for each station – with part styles automatically selected by the PLC. By incorporating PPT M200 cameras and PPT M-40 machine vision processors with LED and xenon strobe light sources, and performing extensive testing during commissioning, we were able to successfully meet or exceed FDA validation requirements. These high standards are maintained by periodically challenging the system with known defective parts. 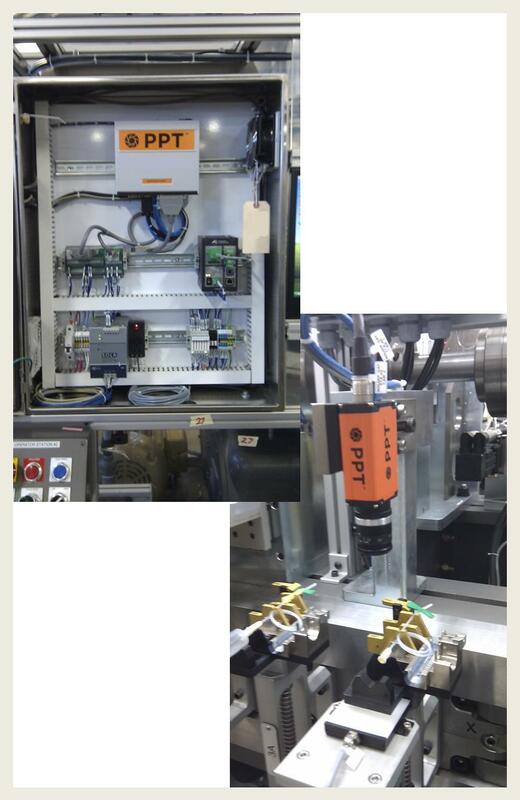 Mercator Robotec’s solution for this customer included three assembly verification inspection stations and a packaging inspection on a Multivac blister packing machine. An HMI, commissioning and startup support and documentation (a software functional specification document, PLC communication specification document, and operating instructions) were included in the project deliverables. To learn more about this system, or our other products and services, please contact Mercator Robotec Inc. Product Description Mercator Robotec Inc. designed and integrated this 4 station machine vision system for a medical device Assembly Line. In process testing performed The system is periodically challenged with known defective parts. Extensive testing to meet FDA validation requirements was performed during commissioning.